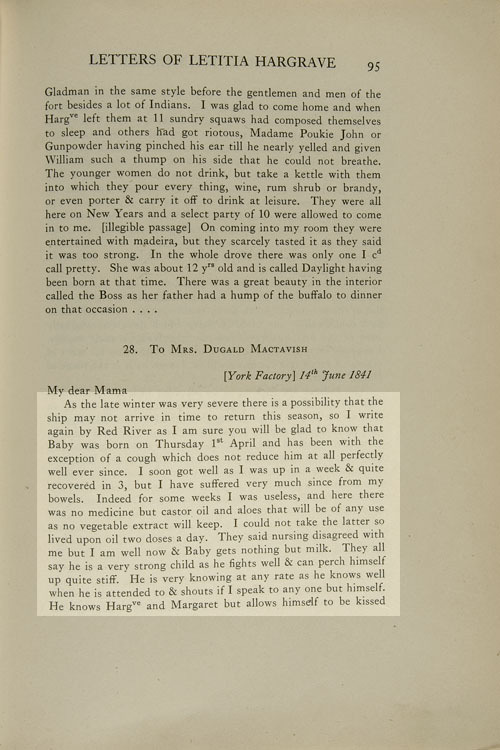 “As the late winter was very severe there is a possibility that the ship may not arrive in time to return this season, so I write again by Red River as I am sure you will be glad to know that Baby was born on Thursday 1st April and has been with the exception of a cough which does not reduce him at all perfectly well ever since. I soon got well as I was up in a week and quite recovered in 3, but I have suffered very much since from my bowels. Indeed for some weeks I was useless, and here there was no medicine but castor oil and aloes that will be of any use as no vegetable extract will keep. I could not take the latter so lived upon oil two doses a day. A band of them came the day after he was born to ask for me and to see the Speaking Cushion (which is son) and were surprised that they were not admitted to our room. Mrs Gladman was very kind, she came over when I was ill and staid two days, nursed Baby for nearly a week as his first exploit was to insist on drink before he was dressed so the Dr said I had better let her give him some. Check the Beaver Index - e.g., type in children, births, health, etc. Mrs. Gladman was Harriett Vincent, the Métis wife of Chief Trade George Gladman and godmother of young Joseph James. Letitia Hargrave first described Mrs. Gladman as "as large as a lady can be and dressed to death in a Waterloo blue Merino, moccasins, a straw bonnet lined with lilac satin with a profusion of lilac blue and white ribbon and a cap border of very broad blonde, the same depth all round, no gloves and a silk shawl, the old fashion white around and green pattern."